Brenda is a writer and environmental advocate, a member of the Vancouver Hack Space, Vancouver Tool Library and a co-creator of the HiVE. She teaches green building courses and creative collaboration at the University of British Columbia, and has helped green such projects as the Whistler and Vancouver Olympic Villages. As a maker, she makes “new” things out of old, out-dated, and broken things. 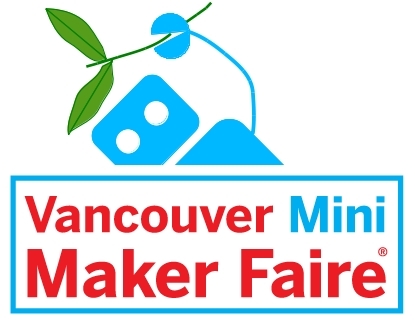 “I would like Vancouver’s to be the greenest Maker Faire anywhere.” These were the words, casually spoken by one of the Vancouver Mini Maker Faire’s founders, that started a thought process that percolated for many months before the decision to act. I contacted the Vancouver Maker Foundation and offered to lead the cause of “greening” the next Faire in Vancouver, and to open-source and share the process so that others could replicate our effort. Maker Faires are the showcase of the Maker Movement, and the ethos of makers, of re-purposing and finding utility where others see waste, means that sustainability and the maker movement go together like peanut butter and jelly. No Budget, No Resources… No Problem. I was aware, before making this commitment, that there were no funds available to implement any of the strategies we might come up with, so everything had to either have no-cost, or be self-funded, and could not take any funding away from the Maker Faire itself. I was also aware that the volunteers and the organizer were stretched to their limits in terms of time, so extra help of this kind was not available. Makers, however, are a resourceful bunch, and these are the exact kinds of conditions that bring out the best of the maker spirit. I believe very strongly that for sustainability to take hold, it has to originate from within the community. If an organization hires an individual to “coordinate” or manage their sustainability, they will likely generate programs that have limited success. That meant that partnerships were the best, most fun, and possibly the only way to accomplish our goals. To make something like this happen, you have to be willing to leverage your personal and work networks. Fortunately, I was already involved with some of the organizations that are affiliated with the Vancouver MMF, such as the Vancouver Hack Space (VHS), the HiVE (a co-working space), and the Vancouver Tool Library, and on the margins of others like EatART, Community Lab (CoLab) and the Vancouver Design Nerds. The question then was how to engage the community? “Maker Green: Green Jam and Kegs” was the first in what will be a series of brainstorming workshops on greening the faire. The HiVE donated the venue, a widespread invitation was extended to all of the affiliated organizations and then… no response. As it turns out, this was not a case of “if you build it, they will come.” So, I began personally connecting with people within each organization, and was eventually able to secure the attendance of some key individuals – the manager of tech services and sustainability of the PNE (the venue for the fair), the fair organizer, a Vancouver Maker Foundation board member / Hack Space member, one person from the community, with the remainder of the dozen participants from my field of work, the green building industry. What would a regenerative, restorative Maker Faire look like, where the world is a better place environmentally for the event having taken place, rather than just having “less impact”? In this process, aspirational goals are key. These goals need to inspire people – funders to part with their funding, people to work for no pay, and the community at large to participate. Being “less bad” doesn’t quite fit the bill, but “doing good” definitely does. 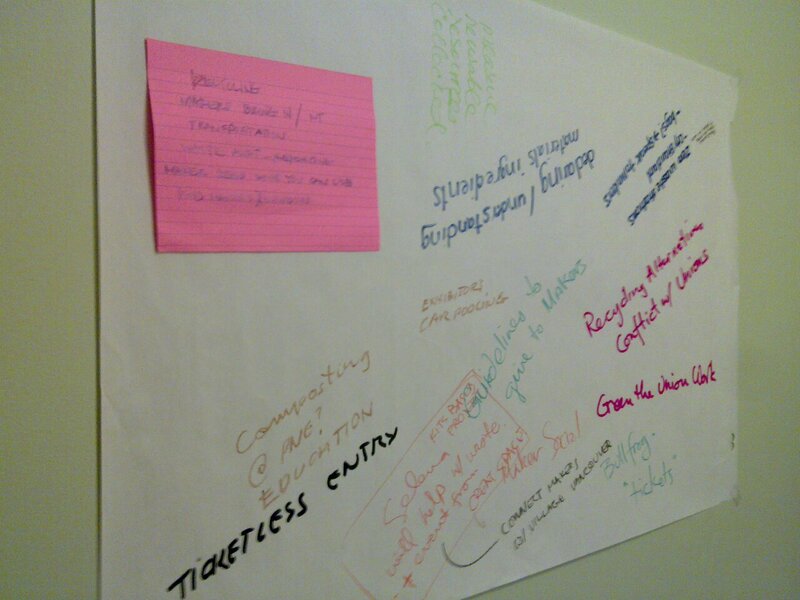 We then brainstormed strategies that could get us to this goal of a regenerative, restorative fair. Match Makers: Setting up a program to match Makers who use ‘waste’ in the production of their creations with Makers, or others, that have that ‘waste’ as part of their output – an industrial ecosystem where the concept of waste is eliminated. Recycle it Here: To counteract the confusion demonstrated by people when confronted with what seems like infinite receptacles for recycling, who then give up and eventually make the choice of throwing their refuse into the garbage, we are going to try to make the recycling containers look like the things that are to be recycled into them. So for example, an aluminum can recycling container looks like a giant aluminum can. E-cycle and Swap Meet: Setting up an area where people could bring their unneeded electronics and either swap for what they do need, have these electronics go to schools and the underprivileged, or if too obsolete, be responsibly recycled. Because this would be waste that was not generated at the faire, but by the community, by providing a convenient facility for recycling, at an event the people were going to anyway, we could divert more waste than we created, giving us the possibility of targeting “less than zero waste”. We are still at the start of this process, and I expect this workshop to be one of many to follow. But every good Maker project needs to build community first, and community engagement remains a challenge – it may be a question of gaining momentum, or it may be that we need to find a person to lead in each of the organizations, so that I can be one of many championing the cause. I look forward to helping to implement the ideas we’ve generated to date, and I am excited to see, and share, the different possibilities the community will create. Look for updates of our efforts on Make: Blog, or contact me at [email protected] to be involved.